Some of these fixes we could have done ourselves, but because we were in a hurry to get our house on the market, we had our handyman tackle them. You know that feeling you get when you fix everything in your house, get it looking beautiful, and think, “Why didn’t we do this years ago?” Me too. 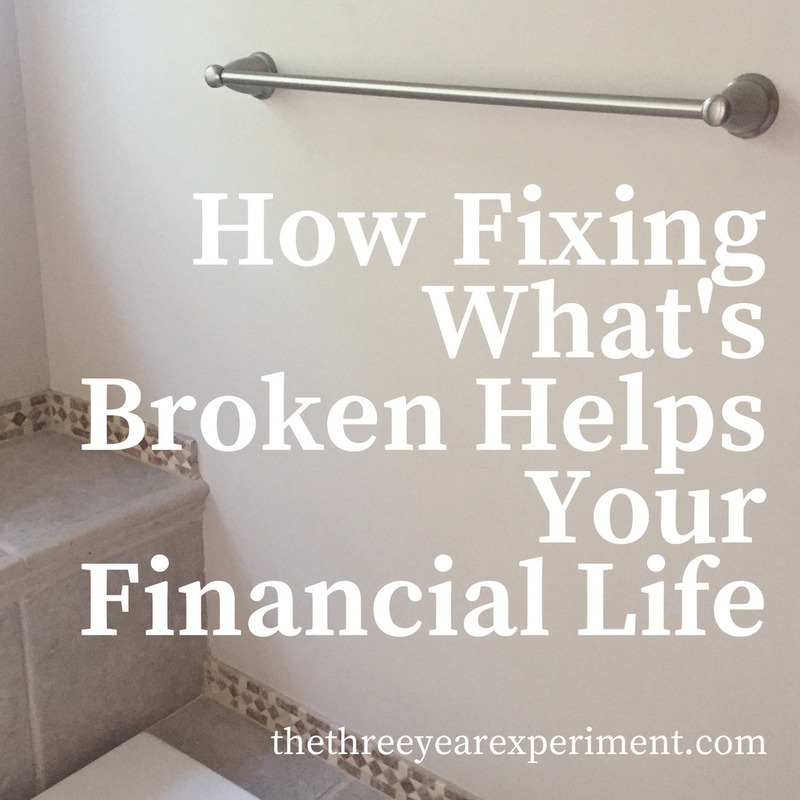 It got me thinking about how fixing all the small broken things in our environments can help our finances, too. Stay with me here, because I’m about to get a little The Secret on you. I realized that looking around my house, day after day, at all the things that needed to be fixed, created an ongoing monologue in my brain, “I need to get that fixed.” “That sink has been broken for six months. When will we get that fixed?” This was all low-level noise, and I didn’t really do anything about it. I just generally responded to my head with, “Not now.” But, over time, all the broken stuff started to weigh on me mentally. Because I was always thinking about the stuff we needed to have done, I couldn’t just sit in a chair and think about new ways for our family to reach our net worth goal (I’m a big fan of giving yourself time to just think, by the way). I was preoccupied. 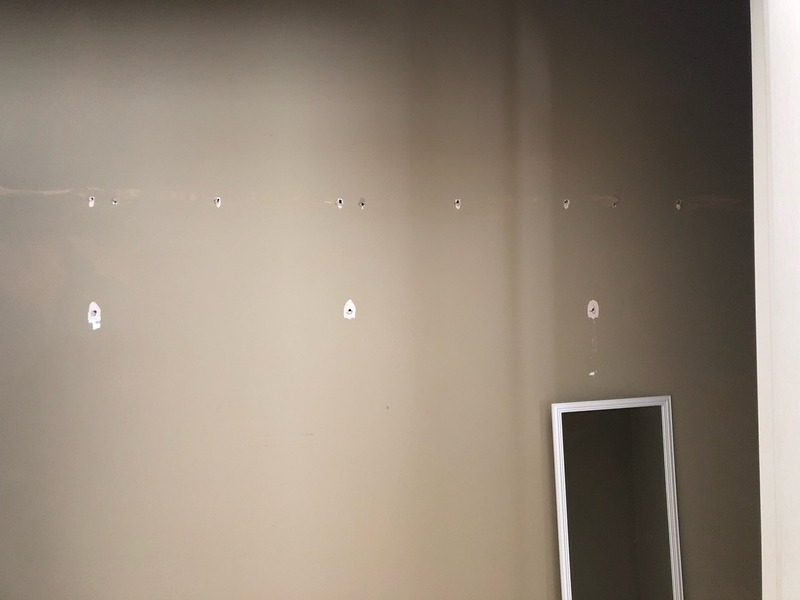 When I looked around in my chair, I’d see walls that needed painting and a sagging bookcase which would lead me to start thinking about the broken washer and the faucet. Maybe I should have turned that mindset off. I did try. But in hindsight, the wiser thing would have been to get the broken stuff fixed. I’m not talking about making your house show-room ready perfect. It’s not perfection we’re after. It’s just getting the big, brain-sucking broken stuff repaired. In other words, when there are a lot of distractions in your environment that take low levels of attention, like the broken sink and the patched spots on the wall, that directly reduces the amount of brain power you have to tackle other projects (creating mental scarcity). When you’re in your house, the to-do list you have to tackle is always somewhere in the back of your mind, sucking all your ability to concentrate on the really important stuff you need to do, like investigate the best credit card points situation. By taking the time to repair all those small things that are broken, you’re freeing up your mind to think about other topics, like money. 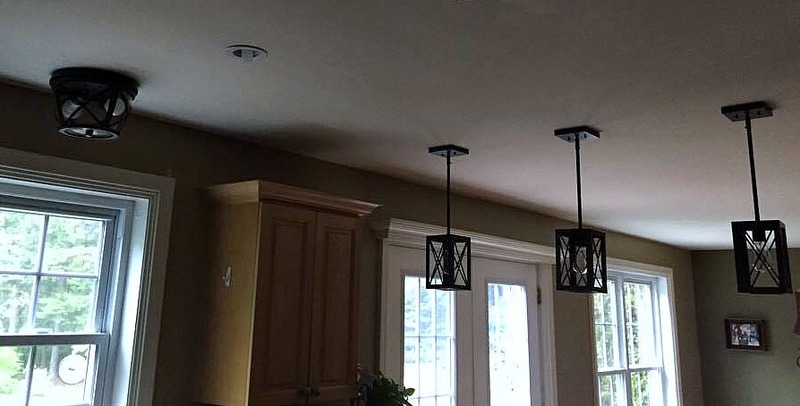 Mr. ThreeYear and I updated some lights in our kitchen last year. Now, every time I look at them, I get a little zing of happiness. I read a book, years ago, written by Jack Canfield, a motivational speaker who was big in the oughts. He recommended several practices that have stuck with me today, because they’re really good advice. One thing he recommended that people do is spend a day or a weekend fixing all the things in your house and your car that are broken. Make a list of everything that needs fixing, then go to a home improvement store, get the materials you need, and fix what’s broken. If you’re not handy, research local handymen who could help. In my experience, they generally charge $20-$40 an hour and can get a bunch of projects done in 2-3 hours. Ask around on Next Door for ideas. Get recommendations from local real estate agents. Make a plan. Then buy the parts you need or get your handyman to do it and get things fixed. It may take several trips so be prepared. It’s worth a week or so of inconvenience for years of having it fixed. A lot of times, I write posts to remind my future self of stuff I used to know. This is one of these posts. When we move at the beginning of July into our new home, I’m going to be tempted to unpack everything and settle into our house. But I have to remember that getting broken things fixed will clear up the mental space to allow me to make more money by looking for jobs, taking on more freelance writing projects, and thinking about more important things than the hole in the wall that’s been driving me crazy for six months. I want to take the time to get things set up right. Our new house has a broken closet rack. We’ll make sure that gets fixed. Since getting our house fixed and ready for sale, I’ve worked at applying my newfound realization to other areas. For example, I had tons of bowls and glass storage containers whose plastic lids had cracked. I found a set of silicon lids on Amazon for $8.50 and bought them. Now, my storage containers have tops again. One of my bowls with its new silicone lid. They came in all sizes and are microwave and dishwasher safe. We’ve also bought replacement charging cords for our cell phones, because ours were frayed and falling apart. And finally, we bought a cell phone mount for my car so that I can put it on the dashboard when I’m using Google Maps for directions (which will happen a lot in North Carolina, I suspect). Okay, how does spending money really help you improve your financial life? Here’s my theory. One of the reasons that I’m always loathe to get things fixed is because I think it will cost a ton of money, and I don’t ever allow myself to spend the time to do it. But I realized fixing broken things doesn’t cost as much as I always worry it will, and I need to budget both the money and the time for several reasons. When I’m distracted by broken things around the house (or by moving!) I’m more likely to make a mistake that will cost money. Last month, right after we left for Montreal, an extra-large credit card bill was taken out of our account before Mr. ThreeYear received reimbursement money (he expenses his travel on our personal card to get the rewards) and I overdrew our account. Cost: $30. This happened because I was distracted. Having a home environment that’s pleasing and creates calm allows you to spend more time and mental energy on tasks that can improve your bottom line: researching cheaper auto insurance, taking the time to send in your rebate information, looking into refinancing your mortgage at a better interest rate. You’ll have more time to read personal finance blogs and/or otherwise read and learn about money. 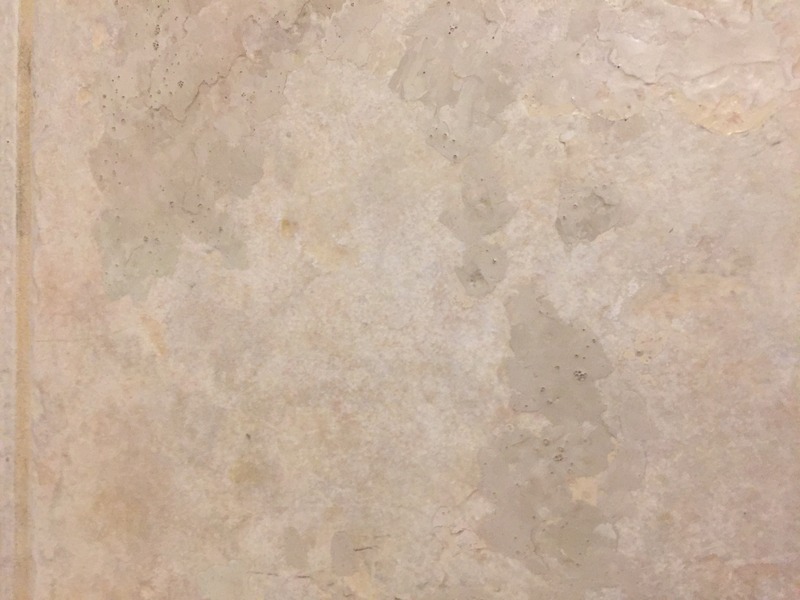 This shower tile had really unsightly holes where the tile had worn away. I fixed them with enamel airplane model paint. Having a home where you’ve taken the time to fix what’s broken also makes you proud of yourself. I feel a positive jolt every time I turn on the washer, and don’t have to go behind it and stretch the extension cord to the plug anymore. “I got that done,” I think. And when you’re proud of yourself, you’re more likely to have confidence in yourself and trust yourself to make better (and perhaps even bolder, but in a good way) decisions. What do you think about this theory? Is it a good idea to spend the money and time to get broken things fixed, or should you just live with them because they’re not that big of a deal? Haha, this makes so much sense! Our house is on the market and we are scrambling to finish up lots of little repairs. I had stripped the old wallpaper border in our bathroom months ago but not yet painted the room, and when I finally did it, it only took a few hours one day. You’re right that those things eat up mental space and cause distraction. (Probably why potential buyers are asking so many questions, ha!) Good luck with your move! You too Mrs. COD! Ugh wallpaper. It’s my nemesis. Good luck to you guys. Hope you sell it quick! we have a very old house and could spend a year updating/fixing things that “are a little off.” that being said we always do the stuff that could harm the house like electrical or plumbing. we hire those things out although i did install a faucet about 10 years ago with success. the cosmetic stuff we take on about one room per year for paint or fixing plaster, taking down paneling, etc. we’ve done those tasks ourselves too and it’s a big learning curve. the thing i love about free mental bandwidth more than productivity gains are enjoyment of life gains. when is the moving van coming? Well in the case of an old house it’s a different story, I think. I like your fixing one room a year idea. That’s a good plan. Our fear is we get in our house and then do nothing to it like we did in this house. But if you tackle a room per year then that’s doable. And yes, you’re right–the enjoyment of life gains are pretty awesome too (I’m so Type A of course I jump to productivity first). Mr. ThreeYear cannot relax when the house is a disaster either. We’re moving out June 27th and closing the 29th…. so we have less than two weeks! Yes! I find getting rid of / fixing broken things creates so much space for new things, ideas, connections and possibilities to come in! Yes, ideas and connections too–good points! It’s really so miraculous the ways our brains work, right? I agree wholeheartedly. I’m a busy working mama with two 15 month old boys (twins). When I finally threw my ex out for the final time, I fixed all the things he messed up or just never got around to, organized everything that kept getting messed up because he made a mess of everything and didn’t clean up after himself, and I spent some small amounts on some things to help me get organized and reduce clutter and doing these things certainly cleared up a lot of mental bandwidth that allowed me to be more efficient and focus more on things that matter, like quality time with my kids. Even though I’m saving to buy a home and I’m “over” living in my current one, it is much easier to live in having accomplished these things. I like where you are coming from here! It can apply to other areas of life too. I guess once I’m back in the UK I’ll have a look around and see what needs fixing/updating! Let us know how the repairs go in your new home. All the best with your move. Thanks Mo! I sure will. When are you headed back to the UK? Not anytime soon, right? Are you renting out your place there? I feel the same way about cleaning up. Just putting things into place makes it easier to work on other more focus-requiring things. Sometimes, I have realised, for these reasons I actually end up being more productive outside the house, like a coffee shop. As for your question, it makes utmost sense to fix what’s broken and budget for the money and time that it might require, as they could end up paying much bigger unrelated returns. Me too Aparna!! Sometimes I just have to leave the house because there’s so much going on in my brain otherwise. Which has been a problem here in New Hampshire, because the closest coffee shop is at least 25 minutes away, and in the winter, forget it. I agree–we just got our inspection report back from the new house, and we’re going to make sure all the items they recommended we fix get fixed, one way or the other (either the sellers do it, or we get a credit and do it once we move). 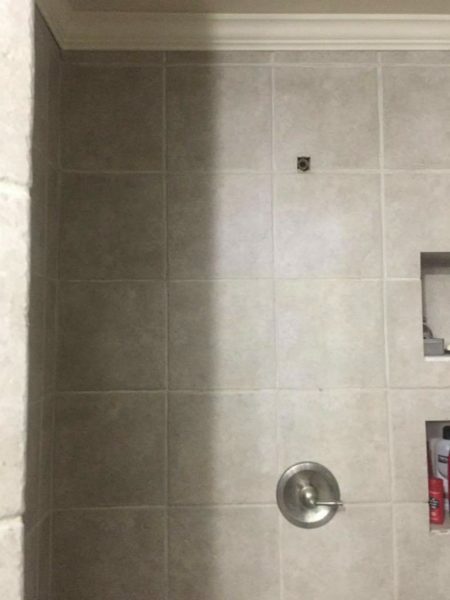 I feel like especially with something like leaks (which luckily there were no signs of in the new place) if you don’t get those repaired, you’re looking at a lot more money down the road. Love this post. When I have all these little unclosed mental loops, I start losing items and forgetting to do big things. It’s remarkable how much a little thing like a sticky door or broken drawer handle can intrude on one’s daily thoughts. We’re not handy, so first order of business is to find a good handyperson. 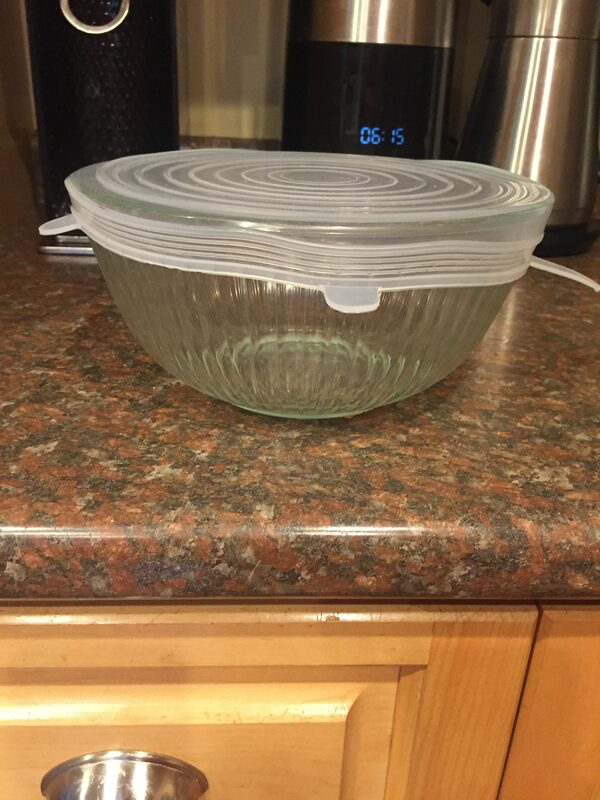 But you’ve inspired me to order a set of new lids for my own pyrex containers–don’t need to be handy to do that! Thanks Frieda. I hope the new lids help clear the brain a bit for you! We’re not very handy either, and we realized that finding a good handyman really is key. We’ve got to find one in our new place now so our new list of broken things can get fixed!